Melbourne-based architects Kae Woei Lim and Elena Low were awarded top prizes at the international 3D printed fashion competition organized by Nanyang Technological University (NTU), Singapore. The fashion contest was organized in conjunction with the opening of NTU’s $30 million Additive Manufacturing Centre, which will house modern 3D printers. According to the article on XYZ Workshop, the competition called for entrants to design wearable 3D-printed fashion pieces that were both sustainability-themed and water inspired. Kae Lim and Elena Low’s award winning design was inspired by the process of the electrolysis and creation of hydrogen, which was expressed through a series of solid and “open” spheres embedded on the design to reflect molecules’ transient change of state as they undergo electrolysis. At a micro level, stillness is embodied by the ripple-like patterns, which has a texture that alludes to a traditional textile weave. The silhouette of the garment was made to resemble that of the traditional Chinese cheongsam, creating an interesting mixture between tradition and technology. 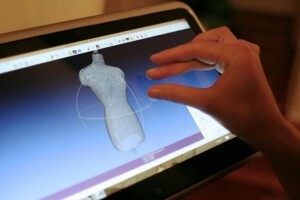 The first step of the design process required scanning of a tailor’s mannequin, followed by the creation of a 3-dimensional point cloud of the objet. The architects then created a 3D mesh that they could work with on Rhino 3D. By using 3D modelling software, they were able to map the patterns of the model, much like a traditional tailor would. After this, the model was printed out in 26 segments of Flexible PLA over the course of 170 hours. Even though they constrained themselves to the use of an Ultimaker 3D printer, designers also created a version comprising of only five parts for printing on a large format 3D printer, allowing one to streamline its production. The purpose of this design was to showcase the disruptive potential of 3D printing and its unparalleled ability to empower the end user. According to Kae Lim and Elena Low, one doe’s not require the use of an expensive 3D printer to create unique wearable pieces. They say that highly accessible domestic 3D printers can do the job just as well.